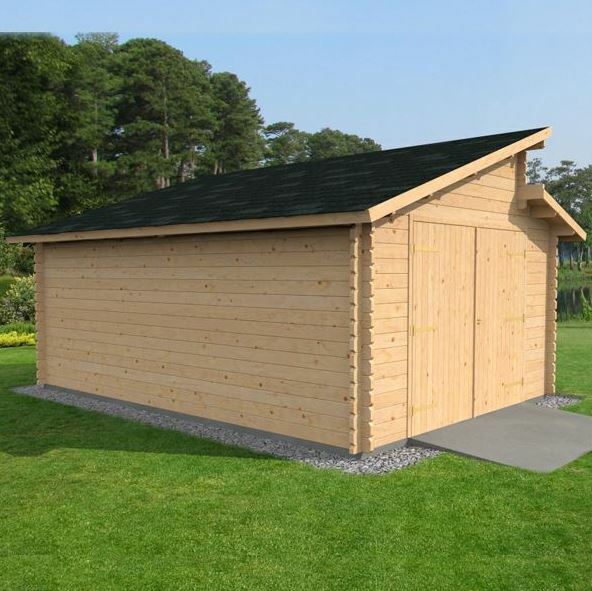 This bold, architecturally striking log cabin boasts a fantastically modern design that will look great in any garden. It comes with thick double glazed static windows, 44mm thick timber construction and secure, lockable double doors. Ideal for use as a garage as well as a workshop or storage area, this multi-use building is made to an incredibly high standard. The 44mm timber cladding is particularly impressive and one of the biggest benefits of the garages overall design. It not only ensures the building can withstand even the harshest weather conditions, but it also makes it virtually impossible to break into. Add the benefits provided by the secure, lockable double doors and the double glazed static windows and you have one of the most secure garages on the market. The placement of the windows is also unique and offers two significant benefits. Firstly you get to enjoy plenty of natural lighting, without having to worry about anybody peering into the garage. This produces both security and privacy benefits. Then secondly as they are so high up, it makes them a lot more difficult to ‘accidentally’ break. This is definitely a benefit parents with young children will appreciate! All in all this is a truly remarkable garage with a distinctive appearance and a fantastic selection of advanced features. The initial high cost of this garage can be off-putting. However, for what you are getting and the quality of its design, you’ll soon discover it offers pretty incredible value for money. 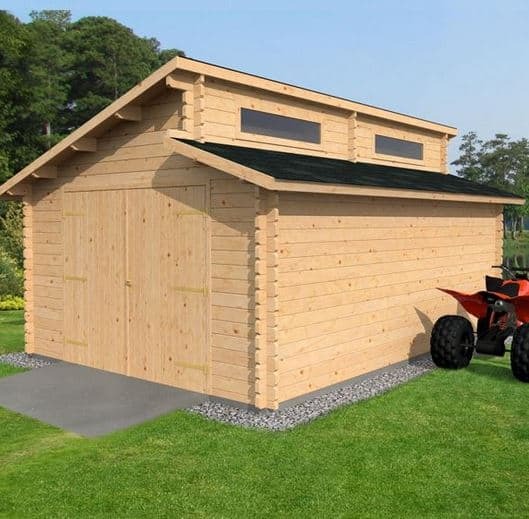 This is a large, unique solid wooden garage with a thick log cabin design. 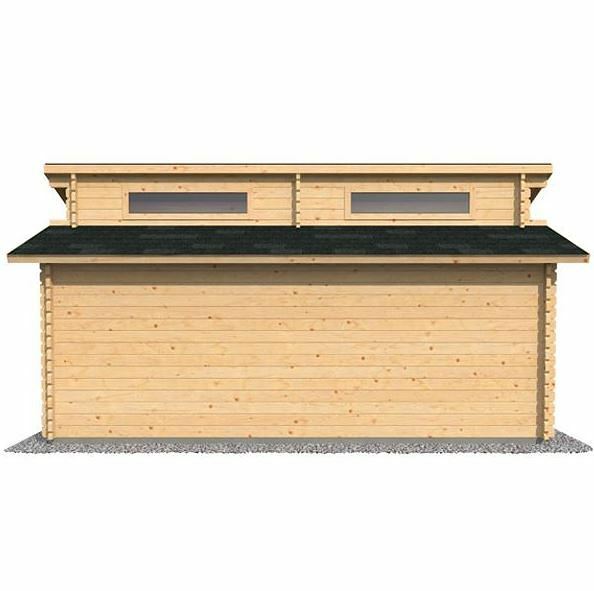 Capable of being used as a multi-purpose building, it comes with a split level roof and a modern, high-end style. The design of the roof comes with many great benefits, with the main one being that it provides an ideal placement for the windows, ensuring plenty of natural light enters the building without compromising security. 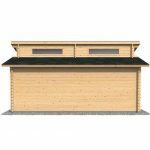 Both the higher and lower roofs benefit from an apex style which guides rainwater diagonally down off the building and onto the floor. Measuring 3.12m high, the roof has a much taller design than a lot of garages on the market. This not only makes the building great for storing larger cars and tools, but it also gives you an exceptional amount of head height to comfortably walk around the building. The eaves also come with a taller than average design, measuring 2.05m. With a 5.40m depth and 3.50m width, you are also given a lot of internal space. To ensure you can easily move vehicles in and out of the garage, Waltons have also made the double doors 2.40m wide and 2.01m tall. Log cabin buildings tend to feature a much stronger type of cladding than standard wooden buildings. The 44mm thick interlocking double tongue and groove cladding featured on this garage is a prime example. Tongue and groove is used on a lot of wooden buildings due to its great weather resistance and security. 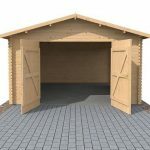 The fact that this garage features a double tongue and groove construction further increases those benefits and ensures you have a building that really lasts. It is even capable of withstanding harsh winter conditions. Another noteworthy addition to the construction of this garage is the corner joints chalet connections. A unique and exclusive feature, not only does this design give the garage a more attractive style, but it also further boosts strength and rigidity. The exterior of the building couldn’t be any better designed. So what about the interior? You can tell a lot about the quality of a wooden building by the construction of the interior. It’s easy to give the exterior a high quality, durable design. However, it’s often the parts of the building you can’t see that really make a difference to its durability. That’s why we are really impressed by the thickness of the frame and the materials used to construct the roof. It features a superb 19mm thick tongue and groove construction which makes the roof outstandingly strong. One of the only slight niggles we have with this garage is that the manufacturer doesn’t make it very clear about the type of floor included. There is a floor and as you would expect it comes with the same high standard construction as the rest of the structure. It is very important to make sure you’re building this floor on a flat, even surface. 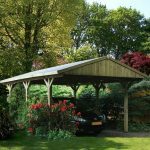 Therefore we would recommend you build it on top of either paving slabs or concrete. Even though the double tongue and groove does enhance this building’s durability, it still requires treatment in order to offer full protection against the elements. A water treatment will have been applied to the timber before it is shipped out to you. This is solely to protect it from any potential damage during transit. It is clearly stated on the manufacturer site that the timber will also need to be treated with a high quality preservative once you’ve put it all together. However, we’d actually recommend treating it before you assemble the garage as this tends to be the easiest method. Once initially treated, you will need to follow the instructions provided by the treatment supplier to ensure you keep the building constantly protected. This will also ensure you are covered by the 10 year anti-rot guarantee supplied with the building. This garage benefits from exceptionally large double doors. They open up extra-wide to enable you to drive a vehicle in and out with ease. In order to make them ultra-stable, the manufacturer has also given them a cross beam design which helps to stop the door sagging over time. Like the rest of the building, these doors have a very thick construction, helping to give them a much heavier and more durable design. To eliminate the need for an electrical pack, double glazed windows have been included high up on the shed. Electrical packs definitely come with benefits as they help to connect the building to the mains, providing a useful source of electric for power tools, as well as adding light whenever you need it. But these static windows provide a fantastic amount of natural lighting and due to their location you don’t need to worry about them getting smashed easily. This is great news if you have accident-prone children! Both the security and privacy benefits of this garage are fantastic. There are several noteworthy security features which help to give you ultimate peace of mind. Firstly you have the ultra-thick cladding which makes it virtually impossible for thieves to break through. However, the best security feature is undoubtedly the lock and key double doors. A lot of outdoor buildings come with pretty basic locks which wouldn’t take too much effort to break into. As the one featured on this garage is locked with a key, it makes it very difficult for a would-be-thief to gain access through the doors. So the entire building is secure thanks to these features. The placement of the windows is also a great privacy feature. Usually when an outdoor building has windows, it doesn’t provide any privacy and whatever you store can be viewed by anybody walking past. However, unless a potential thief comes along with a ladder, they won’t be able to see inside. What’s great about this is not only do you benefit from a high level of privacy, but you also get a lot of natural lighting, limiting the extra costs that would come with installing an electrical pack. There are some pretty exciting and impressive customisation options and extras available with this garage. Take the ArmourShield Shingles for example. As standard the roof of the garage comes with a heavy duty felt. Don’t get us wrong, this does provide a good level of cover against rainwater. However, if you want to ensure you are getting the maximum longevity out of this garage you may want to consider upgrading. The ArmourShield Shingles are available in charcoal or green, just like the superior duty felt upgrade. What makes these an excellent choice over felt is the fact that they offer a unique honeycomb design and a much higher level of protection. They also have a self-adhesive feature which makes installing them a breeze. Another exclusive upgrade we like is the solar panel options. There are five different types of solar panels, with the cost varying significantly between them. As mentioned the garage does provide a great amount of natural lighting. However, unless you only plan on using the building in daylight hours on bright sunny days, there will be times when you need additional light. An electrical pack is the obvious upgrade here. However, not only do you need to worry about the initial cost of the pack, but you also have to consider the long-term costs involved too. Solar panels may come with an extremely high initial cost, but they do provide you with a consistent level of renewable energy. This is great for both your wallet and the environment. Finally another upgrade worth considering is the Eco-Quilt Garden Building Insulation Kit. 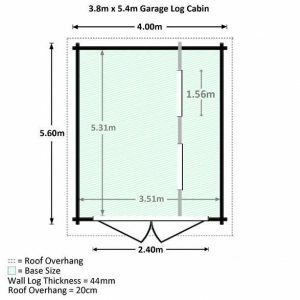 Available in two different thicknesses, this kit can be installed in the walls, floor or roof and it helps to make the garage more comfortable; particularly in the cold winter months. This is one of the best and most impressive quality buildings we’ve ever reviewed. 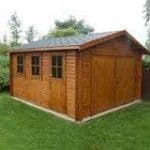 The thick timber logs used and the overall construction of the garage provide an outstanding quality that’s hard to beat. There’s just one thing that stopped us giving this a 10/10 rating and that’s the fact that it requires regular treatments. We dare say even without the treatments you’d still benefit from a garage that lasts for many years to come. However, the treatments are required to ensure you benefit from the 10 year anti-rot warranty. 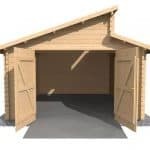 This is a large garage, but we do recommend you use it for small to medium size vehicles. It is taller rather than wider so it would easily hold tall equipment as well as vehicles. You are also given the chance to install shelving and hang heavy tools off the interior walls thanks to the exceptionally thick cladding. You only need to take a look at this garage to see that there are likely going to be some issues with installation. However, to make it easier Waltons do have a useful installation video. We highly recommend you watch this before attempting to put it together. We also recommend you consider taking advantage of the Waltons installation service. That way you can let somebody else do the hard work. However, keep in mind that this service does not include installation of extras such as the solar panels and shingles. This is one of the most expensive buildings offered by Waltons and if you want to take advantage of the extras available it will push the cost up close to £4,000, if not more. However, its quality, cladding and impressive range of features actually provide pretty good value for money in the long term. Final Thoughts: This garage isn’t suitable for those on a tight budget and it’s definitely one of the more high-end designed buildings. However, if you do have the budget for this incredible garage, we feel it’s a fantastic investment. The thick timber logs not only provide a sensational level of durability, but they also have a very attractive design. It is an exceptional quality building with a lot of potential to be used for a number of purposes. Before deciding whether this is the right choice for your garden, it’s important to take into account the additional costs if you need to upgrade, as well as the annual treatment costs.